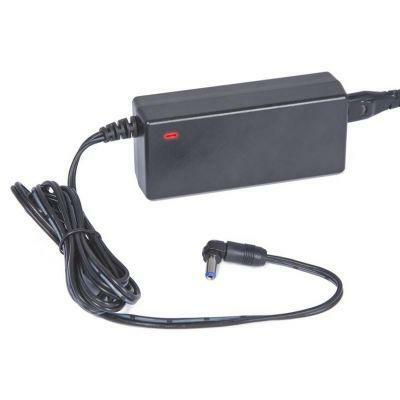 The Baader Planetarium Outdoor Power Supply 60W, supplies 5 Ampere and 12,5 Volt permanent power, so it is perfect for modern, powerful mounts like Celestron mounts: Advanced VX, CGEM (DX), CGE Pro and CPC HD Deluxe. Of course, you can use it with all mounts that need up to 5 Ampere. Conventional power supplies having a 12V nominal voltage are made for use in your living room. When used outside in the cold the voltage will reduce with temperature. At -10°C the remaining voltage output may have gone down to only 10.5 V.
The motors of many telescope mounts will behave in an erratic fashion at such low voltage. The motor driver electronics will try to replace the missing voltage by draining ever more Amps until both - power supply and mount electronics - will stall or become damaged. Many users then blame the mount and its messy electronics - instead of checking whether an inadequate power supply may be the culprit. The two cables which connect between the power supply with telescope and wall socket in total provide a cable length of ca. 1.7m. This is longer than usual and assures that the power supply will not become a tripping hazard or dangle in the air. Even with larger telescopes, the power supply can be laid down on the ground or onto the accessory tray of tripod or pillar. The housing is sealed against moisture, but of course the plugs must not be placed onto a wet ground. Connection cable with elbowed plug for the most common telescopes. Protective-disconnect plug: protects the electronic boards of the telescope from damages at the power socket and the power supply from broken cables and other damage. Matched cable length: The cable to the telescope has got a special extension to allow the power supply to reach a suitable surface to sit on.